So I opened up the door today and found a phone book sitting on the doorstep. Agggghhhhhhh!!!!!!! These things frustrate me and quite honestly, I hadn't thought about them until this monring. But now, here I am, a proud new owner and about to head it down to the basement. If you're like me, you don't use telephone books anymore as you pretty much look everything up online. Now I'm not saying that there is no use for these things as some folks are bound to remain old school in this department, and some are not online, but it should be easy to opt out of these things. Well, as i found out, it is and it isn't. I called the phone book company and told them my dilemma and while they were happy to take my info, they couldn't promise that the books would stop coming. Interesting side note here: Why is it my problem to stop them and not theirs? Anyhoo, I found a great online resource at the Huffington Post on how to deal with phone books. Here's the abridged version. Call the number on the front of the phone book (each is different usually) and tell them you want out. Sign this petition to make it possible to opt out of phone books altogether (this is good for the US, UK, Australia and Canada). Write a letter to the Yellow Pages Association and tell them what you think. Make sure to either use the books you do get to insulate your house, or at least recycle them when you are through. There ya go. Good luck and let me know if you have success! Trying like crazy to catch up on all sorts of things, but thought I'd post this quickly as I haven't in a while. 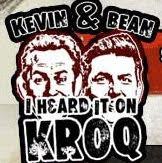 I've been on Kevin and Bean's show on KROQ here in LA at the beginning of every month since January and as of June, they made me a theme song, which totally cracks me up. You can also hear the other interviews there as well. Some better than others, but generally we have a good time.